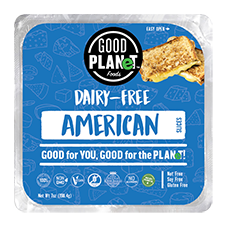 Made from corn instead of shellfish as Glucosamine often is, this all-vegan formulation is certified by the Vegan Society and is a potent formulation for joint health. As a key ingredient in cartilage, Glucosamine plays an important role in good joint health; studies indicate that it provides the building blocks for constructing cartilage. 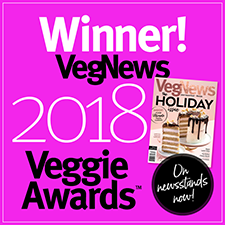 Ideal for athletes or those with arthritis or joint pain, this animal-free supplement is very beneficial as both a preventative measure as well as for helping to combat existing problems, and for those who have difficulty with tablets, these tablets are small in size and very easy to swallow. Each tablet is 500mg, and there are 90 per bottle. $7.99 each. I was skeptical... but it works great! From Anonymous of Los Angeles, California on 11/21/2008 . I had chronic tendinitis from running. I tried anti-inflammatories (little did I know the condition isn't really inflammation), resting (it went away eventually, but came back as soon as I even tried starting up again). I went to the doctor several times, and it came to a matter of going to a podiatrist/sports injury doctor. I decided to give glucosamine a try, since $13 isn't much to waste in light of a specialty doctor. I have had nowhere near the levels of pain before taking this. It's been months, and I'm back to running 3 mi a day. Occasionally I get the slightest hint of pain - but before it hurt just to walk. I'm not even taking what most studies have used as a dose - just one tablet, or 500 mg.
At this point, I don't really care if the effects are placebo or not - I don't feel pain, and that's what matters! From Diane of Madison, Wisconsin on 9/4/2005 . As a blocker, my knees take a lot of punishment during roller derby season, so I use this product, along with Clif Builder Bars, to prepare for and recover from the most brutal bouts. From Anonymous of Newark, California on 10/11/2004 . Since my early 40's, I have had hand and foot pain that is an inherited trait. Regular glucosamine was great until I found out that I was allergic to shellfish, and that supplement was what was causing my sever gastric problems. 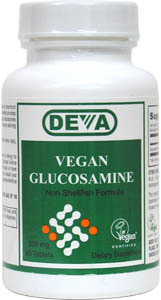 I found Deva Vegan Glucosamine, with my doctor's help. Not only did I have relief from pain, but no gastric upset, unlike another vegetarian brand that I had tried. This supplement is a staple of my vitamin regimen. From Jan McDonald of Toronto, Ontario on 8/27/2004 . A reliable product. I'd been off glucosamine for six months because I'd become aware of non-vegan ingredients. Deva worked for me within 10 days. I experienced complete hip pain comfort, which was a relief since I'd been waking up in pain. I'm in my 50s.